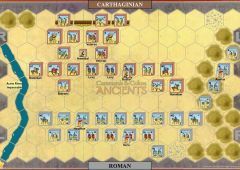 Time runs out for Publius Scipio. 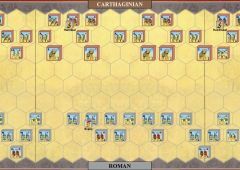 After several years of unbroken successes, the Scipio brothers rashly divide their armies to defeat the Carthaginians in detail. 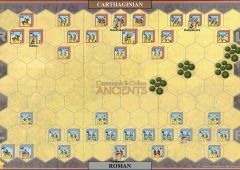 As Publius’s army nears Castulo, he realizes he is facing superior Carthaginian numbers and is in danger of being surrounded. 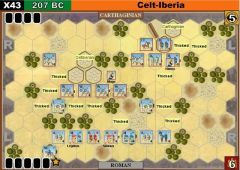 Marching all night, his troops attack a small detachment of 7500 Celt-Iberian warriors under Indibilis blocking the Roman line of retreat. 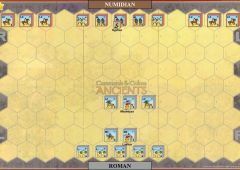 They hold long enough for the Numidian Masinissa and his elite Numidian cavalry to join the fight. 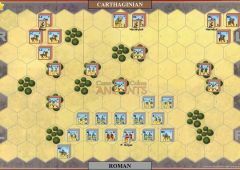 Scipio’s army is not strong enough to defeat both forces quickly, and now the Carthaginian armies of Mago and Hasdrubal arrive on the field, surrounding and destroying the Roman Army. 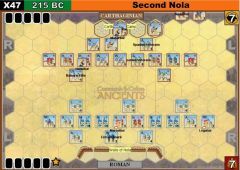 Publius Scipio is killed in the fighting. 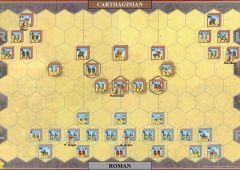 Shortly thereafter, Publius Scipio’s son comes to Spain, rebuilds and retrains the Roman army, and wins the battles of Baecula and Ilipa, avenging the deaths of his father and uncle. 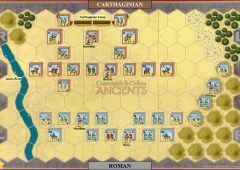 If the Roman leader Publius Scipio is lost, Carthage wins at once. 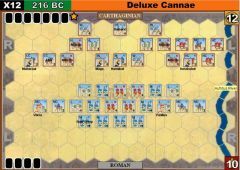 A Roman unit the exits off the Carthaginian side of the battlefield, from a center hex or a hex on the Roman right section, counts as one victory banner. 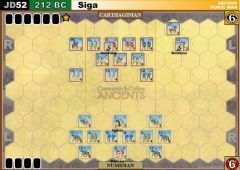 The unit is removed from play. Flip sides with Judd. 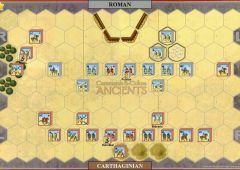 He wins as Rome 8-7 snatching victory from me at the last minute. 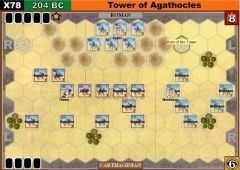 Really good game though. 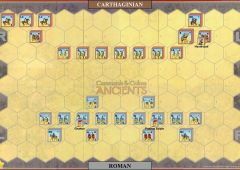 Carthage defeats Rome 8-5. 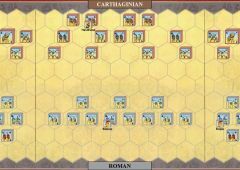 Rome killed a Carthagian leader and was still in the game, but at a crucial moment, played his medium cavarly at the wrong time allowing the defeat. I think there is a couple os such examples also on other profiles. Hi TomKnight3. I see some text around your avatar image. 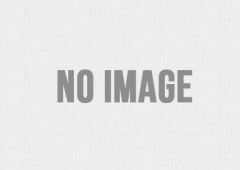 Is it just me or you have a problem in the configuration of your profile? 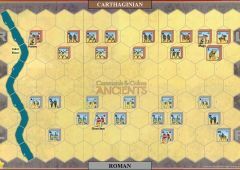 In the second game of the first pair in the tournament, player #2 won as the Roman 8-5 against Carthage. 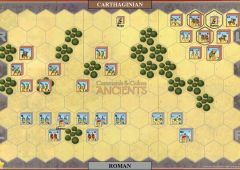 Rome pushed hard on the Carthage left pushing them back. 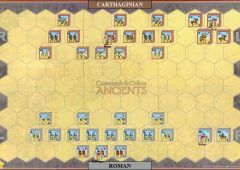 Carthage's center was unorganized. 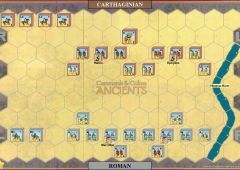 The Carthage right got moving but was too late to do any real damage. 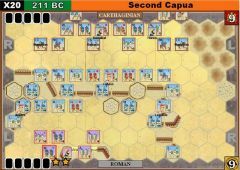 So, for the first pair's battles, Player #2 is up 4 banners moves on to the other players in a good position. Meanwhile, player #1 is now down 4 banners. 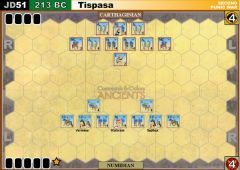 We started a tournament base on this scenario. 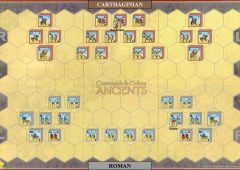 In the first game, Carthage won 8-7 in a close game. 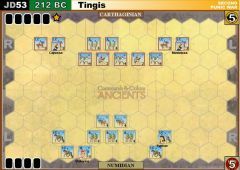 Carthange was helped by 2 mounted charges. 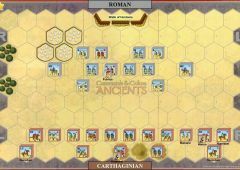 The Romans moved close to the center and right exits. 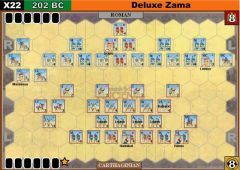 Roman was hampered by drawing no line commands in the entire game. 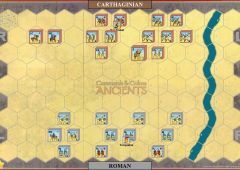 The Roman left was crushed just before the Roman right could strike the Carthagians. A close game and a fun one. 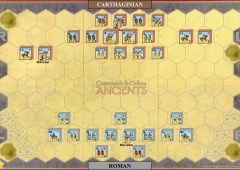 Rome shifted to right and made a mad dash to exit the board. 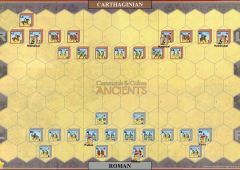 Carthage had trouble putting togther a strong defense to stop them. 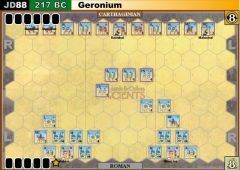 The Roman general had several casualty checks, but survived. 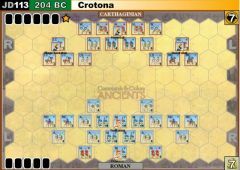 A rally card helped him to gain strenth. 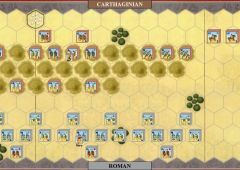 Rome won 8 to 5 without exiting troops off the board. 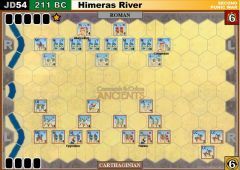 Rome was able to push through the center winning 8-5. 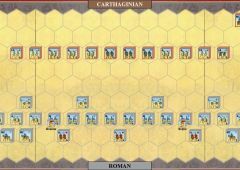 It was really close at the end, with Rome getting two troops off the board. 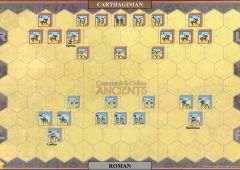 Carthage had one general leave the field. 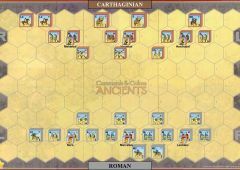 All the Carthagian light calvary were killed in the attempt to stop the Roman troops from exiting. Even two mounted charges could not stopp them. 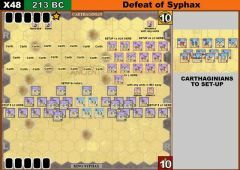 Scipio survied several kill checks. 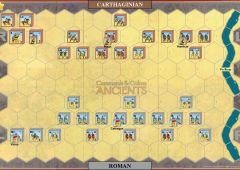 Carthage won in a tight fight 8/7. 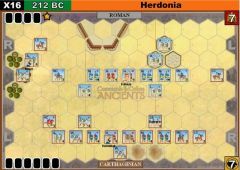 Hasdurbal went to the Roman side of the board taking two banners to end the game. 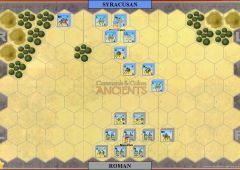 Two Roman units were about to leave the field and gain banners, but they failed to exit in time. 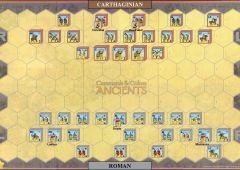 An amazing game, full of tension and nail-biting. 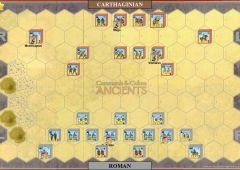 Carthage won when Hasdrubal went man to man with Scipio. 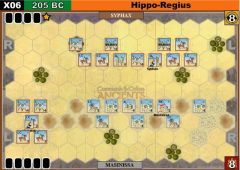 It was 7 to 4 when Hasdrubal crushed Scipio's Medium Infantry making it 8/4. 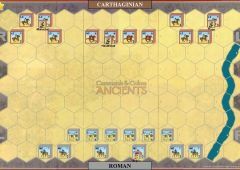 No Romans left the board for the banner bonus. A rematch is scheduled. 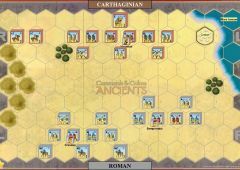 A win for Carthage. 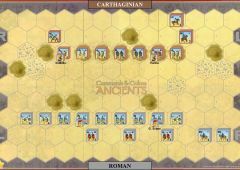 The Roman center rolled forward, annihilating and pushing back the Carthaginians in the way while pulling back the weakened units and keeping Scipio safe. 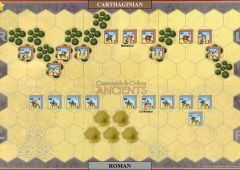 The Romans had a clear road in front of them, when the Carthaginian cavalry swept around the flanks to pick off enough weakened Roman units for the win. 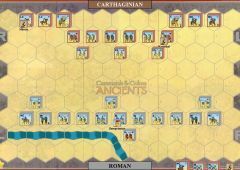 Very interesting scenario. 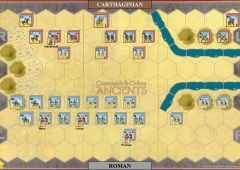 The Carthaginians are effectively trying to stall the Roman army and also seek out and kill Scipio. 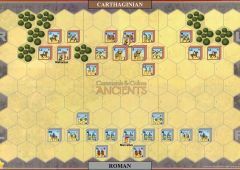 The battle started well for the Romans who had several cards that allowed them to rapidly advance to towards the Carthaginian side of the battle. 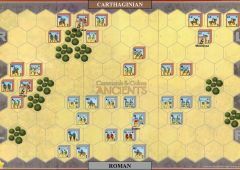 This was going very well as they repulsed Mago's and Masinissa's attacks. 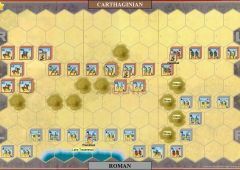 There was some damage, but Scipio held his forces together and protected the army. 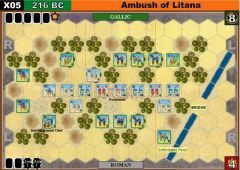 The slow advance would be stopped, however, once Hasdrubal pushed his contingent into conflict. 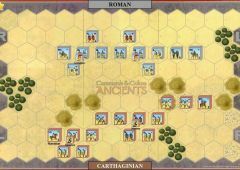 His heavy infantry sliced through the Roman line almost eliminating Scipio himself. 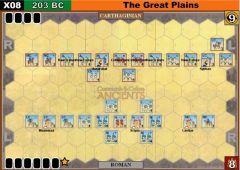 Their final banner came when they eliminated a full strength heavy unit. 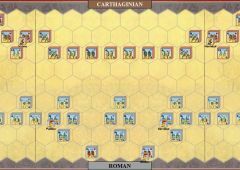 Rome was holding their own for most of this battle. 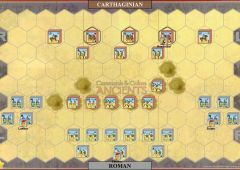 Nearly destroying the entire Carthaginian left early in the battle. 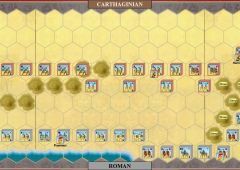 They tried to push their forces forwards again, but Carthage managed to push back any units threatening to exit the field. Mago was completely useless during the battle. 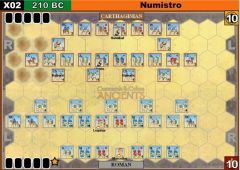 His entire group managed to only inflict two blocks worth of damage. 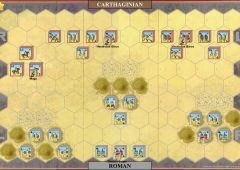 The bulk of kills again came from Hasdrubal's expertly led heavy infantry who again cut the Roman line apart. 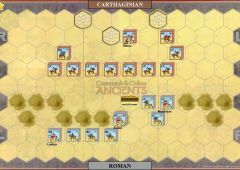 However, it required a desperate gamble of flinging his unit into the power Roman line to pull off the victory.